Comfortable nasal breathing is a sign of a healthy breathing pattern. A blocked nose is one of the most common symptoms of dysfunctional breathing. Mouth breathing is a slippery slope and what may start as a symptom of seasonal allergies or a cold can quickly develop into a permanent situation. When mouth breathing is the norm the nasal passages tend to block: a case of use it or lose it. The following exercise helps soothe nasal mucosa and relax smooth muscle lining the nasal passages and can bring temporary relief from nasal congestion. 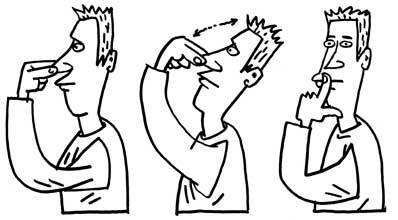 Try to maintain nasal breathing after doing the exercise. Sit on a straight backed chair with an upright posture, shoulders relaxed. Close your mouth if possible and try to breathe gently through your nose during and after the exercise (breathe through pursed lips if your nose is completely blocked). Breathe in for two seconds and out for three seconds. Hold your breath pinching the nostrils lightly between thumb and forefinger. Hold on the out breath for as long as is comfortable and then release your fingers and resume very gentle breathing. This exercise should help clear the airways to permit nasal breathing for a short period. In stubborn cases or when the blockage is due to a cold, you may have to repeat the exercise a few times. This exercise is only a quick fix. However, even temporary clearing of the nasal passages indicates that it should be possible to restore comfortable nasal breathing once you have achieved a functional breathing pattern. New Zealand ENT surgeon Jim Bartley postulated a link between hyperventilation syndrome and nasal congestion. He suggested that correcting the breathing disorder may help avoid surgery.1 We would encourage anyone contemplating surgery for chronic nasal obstruction to consider seeing one of our practitioners for a breathing assessment beforehand. In our clinical experience, most cases of nasal congestion can be resolved without surgical intervention once a healthy breathing pattern is restored. Contact our clinic to learn more. Bartley J. 2005 Nasal congestion and hyperventilation syndrome. Am J Rhinol.